Mount Emei Scenic Area, including Leshan Giant Buddha Scenic Area, comprise the place where Buddhism was first established in China. It is also outstanding for its plant species diversity. 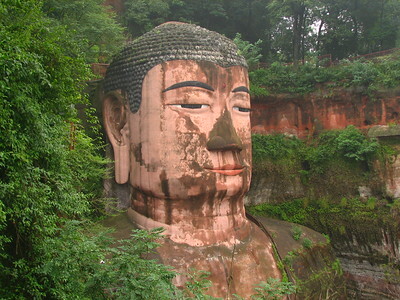 The Giant Buddha of Leshan measures 71 m high overall, which makes it the largest statue of the Buddha in the world. Emei is the most outstanding Buddhist mountain in China. Emei became a sacred Buddhist site following the sixth-century visit of Bodhisattva Puxian and his six-tusked elephant. Here Buddhism first became established on Chinese territory and from where it spread widely throughout the east. Covering Emei Shan is a sub-tropical forest with many endemic and endangered plants. They include orchids, primulas, rhododendrons, camellias, ginkgos, cycads and tree ferns. The mountain is frequently covered in dense cloud, with associated high rainfall and humidity. During early September I stayed for three days in the Emei/Leshan area. Those days were easy to fill because there's a lot to see and do here. The iconic sight of the Giant Buddha for example. I arrived at 8.45 in the morning, and had the place virtually to myself. The bus had dropped me at Dafo's head, and from there you can climb down his body until you arrive at his feet. The way he sits and looks out over the river makes him look like a gentle giant watching over the world. My first two days I spent around Mount Emei. I started with visiting Fuhu Si (Crouching Tiger Temple), today a nunnery. It dates from the 12th century. Its major assets are its location (up against the mountain in dense vegetation) and its great garden complex that is very well taken care of. And oh yes, I did use the cable cars. One of them to be exact - there are two on this mountain!. At the inscription of this site the Advisory Bodies to Unesco were very worried about the cable car "which leads to the Golden Summit of the mountain and brings some 300,000 people a year to the sensitive montane forest zone." I took the lower cable car to Wannian Temple, a lively and colourful one with the statue of Puxian and his six-tusked elephant. From there I hiked down to the foot of the mountain at Baoguo Si in about 5 hours. I passed the Qingyin Pavilion (nicknamed The Mountain Garden for its greenery) and some minor temples. I walked and walked the stone steps, up and down and up again. I met the occasional monk, looked at the fungi and medicinal herbs that were for sale by old women, almost took a wrong turn or two but safely made it back. Emei Shan and its surroundings are surely worth a couple of days of anyone's itinerary. April 1992 I climbed Emeishan, after attending a conference in Hong Kong. I was accompagned by a chinese student who did not want to go to his lessons at the university close to the entrance of the mountain. Instead he liked to practice english with me. I slept in three temples at the mountain. At the top we had a clear view, witch is not often the case. I wrote a story about my travel that i will send lateron, together with some 22 year old poctures. With a chance to stop en-route between India and US in China, I took this opportunity to visit Chengdu for a week to see 3 World Heritage Sites around the city, and Emeishan was a site I wanted to see most. I went to Xinnanmen bus station before 6 AM as I heard that the first bus to Leshan will leave at 6.30, but when I arrived, a local told me that the first bus will leave at 7.30 and recommended me to use minivan at 7 AM instead, a nice alternative. The minivan was very fast and I was in Leshan within 1.30 hour, but minivan did not stop at Xiaoba Bus station where most of tourist buses did, so I planned to take a taxi to the Dafo (Giant Buddha), but no taxi wanted to go there during the rush hour, so the driver offered to take me to the bus stop where a bus to Dafo will pass. Finally I was able to be at the gate of Dafo Scenic Park at 9 AM. When I saw the Dafo, I was impressed with the gigantic size, the statue was not beautiful but very inspiring. Beware the walkway circuit to the Buddha feet was very steep; I was extremely tired after I completed the route. Then I went to Xiaoba bus station to catch a bus to Baoguo Si which is the entrance of Emeishan. After arrived at Baoguo Si, I walked to Fuhu Temple, a nice temple with beautiful Sichuan vernacular style. My favorite spot was the Arhat Hall with countless gilded Buddhist saints statues, the most impressive one was the statue of Goddess of Mercy with her many heads and many hands. Then I walked to Baoguo Temple, and saw beautiful man made waterfalls and a bell golden pavilion. A bus to Leidongping took me 2 hours, along the route I passed lovely forests and tea plantations, when the bus reached the entrance gate of Emeishan, the driver stopped for all passengers to buy entrance ticket. After entrance, the road became hairpin to ascend the high mountain; the weather was very cold with fog and snow. When the bus reached Leidongping, the freezing fog was very thick, the walkways to Jinding (Golden Summit) were covered with ice and mud, I could not see the way at all so I just followed a group of Chinese. I had to walk and climb for another 30 minutes to reach cable car and the last cable car will leave within an hour! In the thick fog I did my best to carefully climb the icy stairs as fast as possible. Suddenly I saw something was moving in the fog, I was terrified at first until I found out that it was just a big monkey on the tree waiting for food from tourists. Within 50 minutes I saw the cable car station, but with low visibility I could not find ticket booth and entered the building from exit way! I had to run to the entrance to buy ticket before I could take a last cable car of that day. At first I was very disheartened by the weather, but when the cable car descended to Jinding passing the thick fog, I found blue sky with bright sun! Everybody in the cable car cheered with joy. 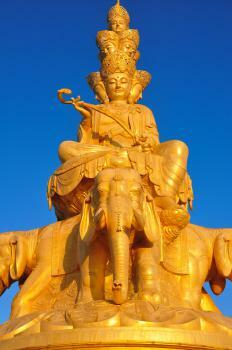 At Jinding, the abode of Puxian Bodhisattva, there was a giant golden statue of Puxian sitting on four elephants, the statue was very beautiful. The scenery was breathtaking with beautiful mountains, big silver and golden temples and gorgeous sea of cloud at sunset with only 20 tourists and minus 4 Celsius, truly a holy place for spiritual seekers and photographers. There were 2 hotels on Jinding which confused many tourists in travel websites namely Golden Summit Hotel (Jinding Da Jiudian), recommended by Chinese Authority, and Golden Summit Villa (Jinding Shanzhuang), this one got nice reviews in Chinese private websites. I stayed in Golden Summit Villa as I trusted local reviews more than the Chinese government. The hotel was nice, clean, and cheaper, the dinner was also good. In the morning I saw the famous sunrise with rays of light creating beautiful multicolor sea of clouds. Then I walked back to Leidongping. I walked pass hundreds of pilgrims, most of them were Chinese tourists carrying big incenses, but also Tibetans, Buddhist monks, nuns, lamas, I also heard other Asian languages. I took a minivan to Wannian Temple and did some hiking back to Baogua Si before I took the last bus back to Chengdu. Emeishan was my second UNESCO listed Chinese Buddhist holy mountains after Wutaishan. Initially I questioned its OUV, but after visit, these two sites were totally different, not only architecture but also the landscape topography environment. Emeishan seemed to be more developed than Wutaishan since it was listed on 1996 much earlier than Wutaishan in 2009 and attracted more tourists. While temples in Wutaishan in my memory were much more grandeur, Emeishan had its own charm with moss covered local building styles dotted with many lovely flowerpots, a great contrast with mainstream Chinese architecture. Another big contrast and a good point on authenticity was at Wutaishan there still was no modern big golden or bronze statue of Bodhisattva, other 3 Buddhist holy mountains, Putuoshan, Jiuhuashan and Emeishan already did. Even though Wutaishan seemed to be more authentic, but I preferred Emeishan as the environment was much better; dense tropical forest did very well to cover all ugly development, while Wutaishan was very dry with few big tree. The natural phenomenon of Emeishan was another draw, the sea of clouds at sunrise and sunset were breathtaking. Hundreds of pilgrims I saw did show me its existing cultural significant among Buddhism devotees in Asia as sacred mountains, a thing I could not directly find in Wutaishan, and considered the price to reach Jinding from Baoguo at 445 Yuan including entrance fee, bus and cable car, these pilgrims had to save their money in order to show devotion to Puxian which impressed me a lot. And if you are a fan of wuxia film, Emeishan was the place where Emeiquan originated. Emeishan in my opinion, a great place to appreciate and understand the value of World Heritage Site that China offered to the world with no need to raise a few eyebrows. Went to Leshan and Emeishan in December 2008. Like most sites in China, it is always rewarding to start early in the day to avoid the crowd. In winter, the boats going in front of Leshan Buddha are few; unless you rent your own. Emeishan is a wonderful experience. It started snowing while hiking; but it was worth it. I recommend spending the night in one of the monasteries. Do not miss the Emei monkeys; but do take care of your belongings. Friends I met there advised showing one's hands when you run into one. If you place your hands in your pockets, they'd think you'd have food to give and they can attack you. In winter, monkeys can get pretty agressive - hungry, actually; and they grab hikers' bags for food! While taking out my video camera, two or three monkeys grabbed and dug into my bag and took my biscuits! Mount Emei was a great experience. For a beginner it could be a difficult climb. Even though there are steps all the way to the top, there are thousands of them! It can be tackled in one long day. Be prepared to gawk at Chinese guys carrying stretchers with tourists in them running up and down the mountain while chain smoking! The monkeys on the mountain are enjoyable and the view from the top of the sunrise over the cloud sea is great. The Buddha in Leshan is great, but very touristy, with people posing and pretending to stick their finger in the Buddha's ear (Like the leaning tower support shots). The stairs going down the side of the cliff near the Buddha can become impassable. I visited the Daifo Buddha this summer during a month long trip to China. It is, without a shadow of doubt, an awesome sight. The Buddha looms out of the rock face surveying all in his kingdom. The entry fees are resonably for a site such as this but, the experience is marred by the fact that the whole site is a tourist trap of the highest order. It is jam-packed with Chinese package tourists. You won't have a moment's personal contemplation! Chinese Garden: Mount Emei's Baoguo temple is also one of the best preserved and most lasting representatives of the typical structure of Chinese ancient gardens. Famous Bells: Mount Emei - Baogua Temple's 25-ton bronze Bell, reputedly the second-largest bell in China. Its echo claim to be heard up to 15 km (9 miles) away. Tea: Mount Emei - There are many tea plantations along the way to Golden Summit. Tibetan Buddhism: "Emei Mountain, which is located within the sight of the Tibetan border, is currently a pilgrimage destination for both Chinese and Tibetan Buddhists. In the past, many Tibetan lamas lived in temples on Mount Emei. A number of them were expert in the Tibetan Lions Roar or Tibetan White Crane gung fu." Taoism: Mount Emei - before the arrival of Buddhism, Mount Emei was Taoism mountain, Fuhu Temple originally was Taoist Temple. Cretaceous: The late Cretaceous period, the Sichuan Movement, Emei original shape of the sedimentary layer of the level of deformation, displacement, there has been uneven degree of fold, faults of varying scale. 124 Community Members have visited.